Last year, my creative side was craving some attention and I found a wonderful and inspiring organisation called BottledSnail Productions which supports and produces many creative and performing arts projects by and for the legal community. I reignited my passion for music by joining Habeas Chorus, a choir for the legal community that formed in 2015. Since then I have wondered why I had never joined a group like this before and why work-life balance seemed so out of reach. Joining Habeas Chorus has not only allowed my creative side to flourish but has also had a surprisingly therapeutic effect of relieving pressures and stresses at work. Giving myself some time to enjoy musical pursuits with other inspiring and like-minded legal professionals has confirmed that we are all much more than just lawyers and we should take the time to nurture our creative sides for general and mental health and wellbeing. Unleashing your creative side can have a surprisingly therapeutic effect. 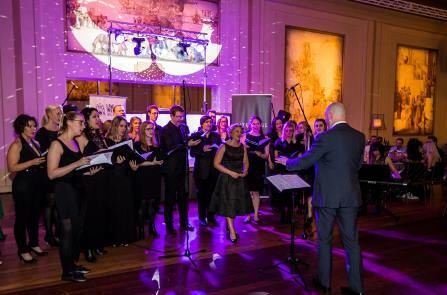 This year BottledSnail’s Habeas Chorus and Melbourne Lawyers Orchestra (Lawchestra) have teamed up with Monash University Choral Society for an epic production to take place in Law Week (16-22 May). Terminus will feature Mozart’s sublime Requiem and the Melbourne premiere of Australian composer Dan Walker’s Last Verses. Terminus is a celebration of life, rallying against the idea of death. Rehearsals are well underway and performances in May will be extraordinary. I can’t recommend enough joining a BottledSnail production to indulge your creativity. Like me, I guarantee most lawyers first thought would be: “I don’t have the time”. Don’t let this be an excuse to avoid getting in touch with your creative side. We may work to six minute increments but that means we are the best at managing our time and we should always schedule time for our mental health and wellbeing. Most lawyers do have a creative side (just like all other people). We may have lost track of it through the rigorous brain re-training of our law degrees and entering the profession but it is still there, eagerly waiting to be expressed. Exercising your mind and your body in a fun and different way is a great method for relieving stress, increasing productivity, and discovering the healthier, happier human being within. Many BottledSnail groups allow you to come along to try it out first. Or why not come along to a BottledSnail production to allow your creative senses to come alive, see what you might be interested in and the fun we have. information. Hear more about BottledSnail Productions’ upcoming productions at www.facebook.com/bottledsnail.